Councillors to decide if gull-proof big belly bins would become permanent fixtures in the city centre following trial. 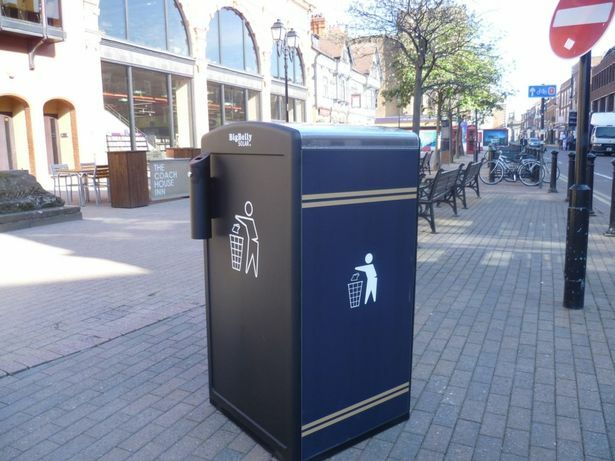 Solar powered bins that were trialled in Worcester over the summer may become permanent fixtures in the city centre if councillors vote to invest in them indefinitely. The bins are designed to hold up to eight times more waste than standard bins and help control the number of gulls in the city. The birds are known to pull half-eaten food out of litterbins. A spokesman from Worcester City Council said: "The council needs to be sure that they are effective. "Councillors will then consider the findings at the next environment committee and will make a decision then as to whether to invest in them permanently. "They will also look at the positioning and quantity of bins, to see if changes need to be made. "If they do give the green light for a permanent investment, the bins will be redesigned to include the city council livery and other features. "Officers will recommend at or shortly after this meeting when the bins could be reinstalled, should councillors agree to invest in them in the long-term."